WW1 Reenactments Equipment : Great War Tommy WW1 Food Rations Labels : Carnation brand Evaporated Milk, 1917. WW1 Reproductions and WW1 Reenactors Equipment / Kit - Carnation brand Evaporated Milk, 1917. 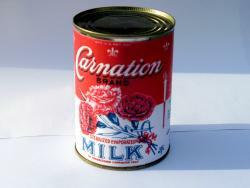 "Carnation" brand Evaporated Milk, 1917. Originally produced by the Pacific Coast Condensed Milk Co, of Kent, Washington State in 1899 by 1916 the iconic tin (with more than a passing resemblance to Campbell's Soup Cans) was produced by the Carnation Milk Products Co. of Seattle.